There has been a great deal of coverage of the issue of student debt over the past several years, but significant nuance to the issue has been lost in much of the reporting around extreme cases of student borrowing. To understand just how different the coverage is from the facts, HPS examined close to 100 articles over a three month period which had stories of students and families burdened by student debt. We wanted to get a sense of what levels of debt are being highlighted in the media and compare that to actual average debt loads as collected in government statistics. The average amount owed by students with debt graduating in 2012 was $29,400. 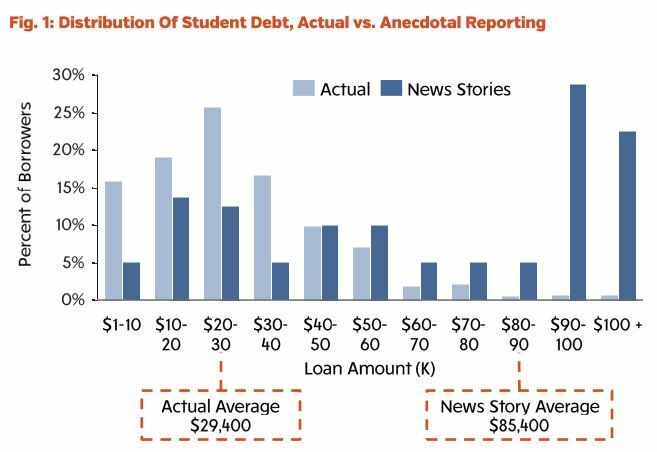 The average debt reported in anecdotal news stories is $85,400. If the anecdotes were a random sample, there would be a 0.000007 percent chance reporters would get this result.